If you shoot Airsoft, Airgun and compete in any Airgun or Airsoft Related Action Shooting that require accurate timing. This is the Timer for you! These are the same Timers used all over the World with Live Fire Ammunition but are specifically redesigned for use with Air Soft and Air Gun style guns. Do not use with or around firearms. For use only with .6 mm 20-32gr airsoft and .177 airguns 7.0-7.5gr @ <600 fps. (This is our folding target stand downsized to fit the smaller 12x20 inch airsoft paper targets. It measures 12.5x5.25x1.125 folded and weighs 37 ounces. This one folds flat for transport and features 7/16 holes for ground spiking but can also be used with sandbags. It is composed of 1x1x1/8 inch angle and 1x2x.062 tubing to accept 1x2 furring strips. Many shooters prefer to practice with the smaller airsoft paper targets and use these for standard firearm practice as well. These can be used in this manner but are not designed to withstand bullet impact). (Popper Diamond Auto Resettable Target is one of the coolest targets on the market today. The highly-visible, diamond-shaped metal target affixed to a pop-up ground mount will provide hours of family shooting fun, at a price everyone can afford. The sturdy target automatically returns upright after being shot and is made of solid steel for lasting durability. Secure target in ground using four stakes (included), or use holes in the metal base to install target onto an elevated wood base with screws. Designed for airsoft/airguns <600 fps, you can use these targets to hone your skills for hunting and competition). • 5ea. Steel Plate 6"x 8"
• 4ea. Steel Plate 5"
• 11ea. Steel Plate 6"
• 1ea Shatterblast refill kit 60ct. • 1ea. Paper Target 100ct. 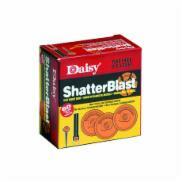 Daisy Shatterblast refill kit 60pk $15ea. Fits ShatterBlast Stakes (872), or use them by themselves! The most exciting target concept to ever hit the market! Made of bio-degradable, non-toxic clay, ShatterBlast target disks S-H-A-T-T-E-R when you shoot them. Simply push a target stake into the ground or bale of hay, (check to make sure your backstop is safe), insert a 2" disk and blast away. 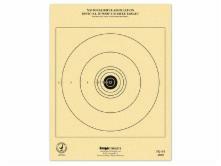 •25 ft air rifle target •Official NRA target •1 bullseye per sheet •7"x9" •100ct Scoring is easier when you use the right target stock, which is why these are official NRA targets. Use for competitions or casual shooting. The Rocket Shot Target is a spring-loaded soda-can-launcher that throws an empty can about 10-12 feet in the air when the paddle is hit. 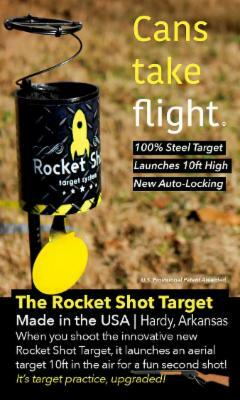 The Rocket Shot Target is great fun for shooters of all ages. First you shoot the 2.5" spring-loaded target trigger that launches the target (can) 10 to 12 feet into the air, then you take your follow-up shot. You can experiment with your own reactive targets and load your system with a soda can, plastic bottle, whiffle ball, or anything else that is lightweight and fits in the auto-locking wide mouth. The system forces you to aim instinctively at the moving target and helps further develop marksmanship. Use the Rocket Shot Target to become a better sharpshooter, hone your instinctive shooting skills, train with your shooting team, or for hours of family fun. Product Tip: Simple to set up, the Rocket Shot Target works best when installed straight up and down (vertically) into the ground. That way the target is sure to launch when the target trigger (paddle) is hit, even with minimal force. Safety rated for airguns that shoot lead ammo only. Be sure there is nothing within range behind the target. Wear safety glasses at all times. Tokyo Marui never ceases to amaze with their innovative new designs and improvements in the airsoft world. Once again, they manage to bring us a product which will set the standard to what future guns will be measured with. The all new M870 full metal gas operated pump action shotgun combines realism with convenience for those looking to utilize a shotgun for CQB skirmishing. This innovative new shotgun has multi shot capability allowing for multiple BB’s to be discharged with one pull of the trigger; with a quick flip of a switch, the M870 can switch between 3 and 6 BB’s discharged with each shot. Until now, shooting more than 3 BB’s at a time was reserved only for shell ejecting shotguns; the M870 however uses the same shells as the original TM shotguns as well as the UTG spring shotguns making it easier to keep track of your shells and with the added advantage of having more ammo per shell. The gas operated system allows for a smooth racking action compared to spring powered shotguns to allow for rapid follow up shots and unrivaled speed. Last but not least, let’s not forget distinct and satisfying sound of a pump action shotgun being racked. Disclaimer: Please refrain from any Hollywood style one handed cycling of the action. This may damage the action and will void your warranty. The build quality of this shotgun is also very impressive. The CAM870 boasts an impressive heft to it adding to the realism. Metal parts include the internals, receiver, barrel, magazine tube, trigger guard, trigger, and action. The pump itself and the stock are made of real wood for that extra little bit of detail. With a 6+1 ammo capacity, you will have more than enough overwhelming firepower to clear any room. Disclaimer: Please practice safe handling and use of the CAM870 airsoft shotgun. Only load field approved plastic / bio-degradable BB's into the shotgun shells. Use of unauthorized loads or foreign objects can lead to serious injury. Play responsibly. CAASES and its affiliates cannot be held liable for improper use of the CAM870 airsoft shotgun. Please refrain from any Hollywood style one handed cycling of the action. This may damage the action and will void your warranty. 370 fps 16 rds Single 6.375" 2.44 lbs. 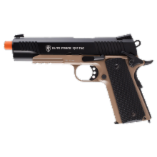 6 mm CO2 11"
The EF Race gun is the first affordable competition airsoft pistol for those serious 3 gun, Steel Challenge, SASP, IDPA and IPSC shooters this will help you get your practice time in your back yard, basement our garage. Best when used with 6mm EF Bio .28gr or .32gr BB's. 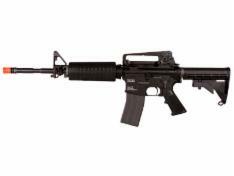 Length: 1030mm Muzzle Velocity: 220~230 FPS (Measured w/ 0.20g BBs and 134a Gas) Magazine: 1-5rds per shell (3rds recommended) Gas Type: 134a Gas (Green Gas not recommended) Firing Modes: Semi-Auto, Safety System: Gas, Shell Ejecting Hopup: N/A Package Includes: Shotgun, 3x Shells, and Manual. The KWA LM4 PTR gas blowback airsoft rifle is a realistic high-performance gun that delivers stunning semi/full automatic shot velocities needed to advance your squad on the battlefield. 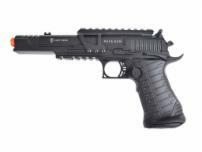 The release of the LM4 marks KWA's entry into the realm of gas blowback training rifles. The rifle provides crisp blowback recoil with every shot and has the same functionality of its real firearm counterpart, the AR15. The LM4 features an adjustable buttstock that accommodates users of any body type, a 40 rd magazine and a shot velocity of 380-400 fps (using .20g BBs). This rifle makes for a highly effective battlefield weapon for intense airsoft skirmishes and is also a great instructional tool for anyone desiring to teach or be taught the fundamentals of weapon handling and safety. Pick yours up today and get ahead of the competition! Elite Force is proud to offer the next generation of M4 Airsoft AEGs within the Competition Series line-up. We took the liberty of reinforcing several key internal parts inside the gearbox to perform better under stress. The next gen line of Elite Force M4 CQB rifles feature an improved tappet plate for higher durability and enhanced sector gear for more reliable feeding from the magazine. We moved away from the traditional M4-style hop-up and used a rotary-style design to add more stability and easy of adjustment. The M110 AEG spring offers just enough power to keep within CQB-friendly velocity limits without sacrificing any available range.